Set on the slopes of the Tramuntana mountains on Mallorca’s north west coast, just 17 kilometres from Palma, this village is the highest on the island, being surrounded on all sides by the most extraordinarily beautiful scenery. It consists largely of stone houses, from grand fincas north of the main road to rustic townhouses and smaller dwellings on the cobbled streets of the town center. Valldemossa and its properties are not only within easy reach of Palma but is also close to Deia and Soller. Visitors flock to explore these pretty and narrow pedestrian streets where each home proudly presents an array of flower arrangements along the facade of the house. Today the village houses remain in the style they have always been and provide fine examples of traditional Mallorcan architecture. The main square, Placa Publica, is the oldest part of Valldemossa. The centre is filled with small boutique shops, cafes and restaurants and attract many visitors who love to stroll by soaking up everything this evidently historical village has to offer. Throughout the year the it plays host to many cultural events, and has an open air theatre. Valldemossa traces its origins all the way back to the Moorish period between the 10th – 12th centuries, pre-dating the Catalan conquest of the island in the early 13th century. But local tourism really began in this small town when during one cold, damp winter in 1838, the composer Frederic Chopin arrived with his lover, George Sand. They rented a former monk’s cell, planning to carry on their affair away from the gossip of Paris and hoping that the climate would benefit Chopin in his battle with tuberculosis. There is a development of homes with perfect sea views recently built just outside of the village, named after his lover. She was a writer herself and penned ‘A Winter in Majorca’ which praised the local area, but also criticised what she perceived as prejudice and vices of the natives. S’Hort de Son Matge is a very family-friendly villa for rent in Valldemossa. 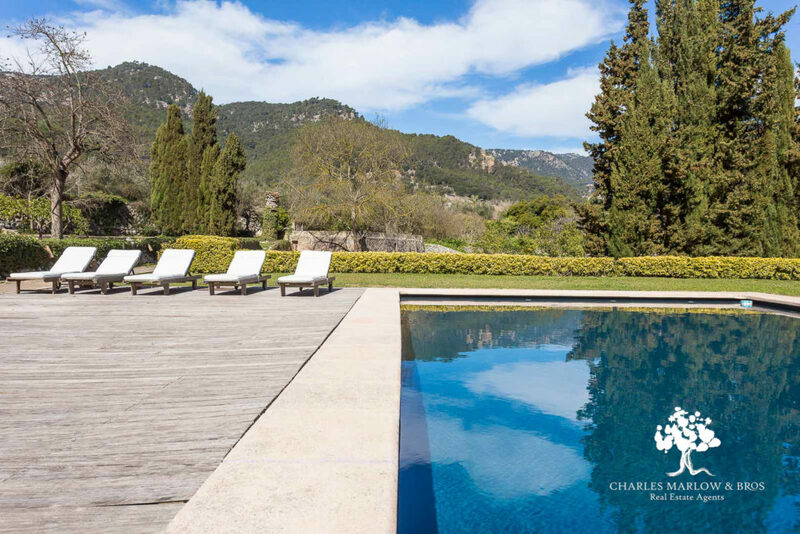 Placed in the valley just below the village, it has wonderful views and privacy – and Palma is just a 10-minute drive away. We have a stunning portfolio of Valldemossa properties for sale. We also keep our eyes open for comfortable and luxurious rentals, and when a beautiful villa emerges in the area, we add it to our list of rentals listings. For more information about villas, fincas and other homes in Valldemossa and its surrounding areas, just contact us directly.